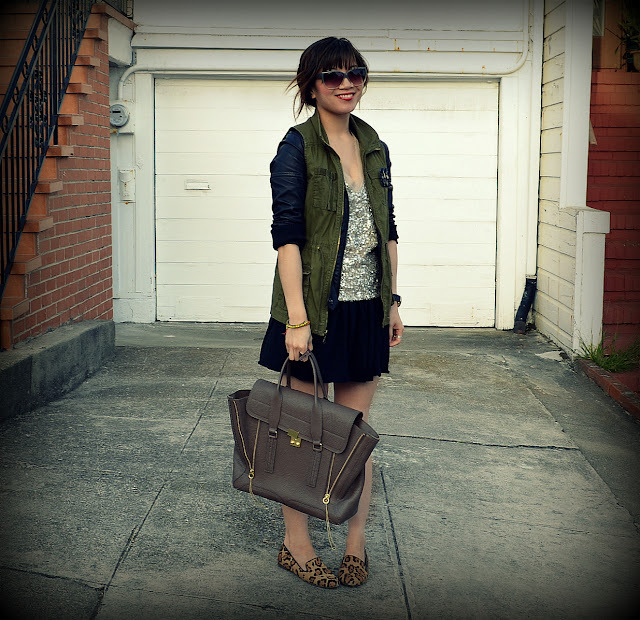 This outfit, as basic as it is, is an atypical one for me. Not because of what I'm wearing but because of what I'm not wearing. I avoided my usual #armswag and statement necklaces as well as my usual pop of color. It's a rather neutral outfit in comparison. I did however incorporate my sense of sparkle with my amazing J.Crew top. I picked up this top ages ago on sale but still love it to bits. Adoring everything you've got going on here!!! The layers are fantastic, esp since you've got sequins, leather, cargo, all those great textures going on. And the leopard shoes are the perfect touch. I love this! The layers are perfect. 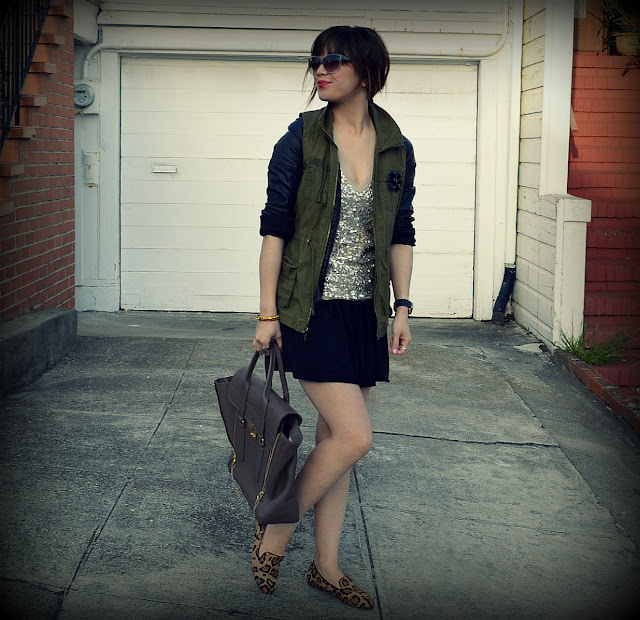 Love the sequins top with the casual vest... LOVE. 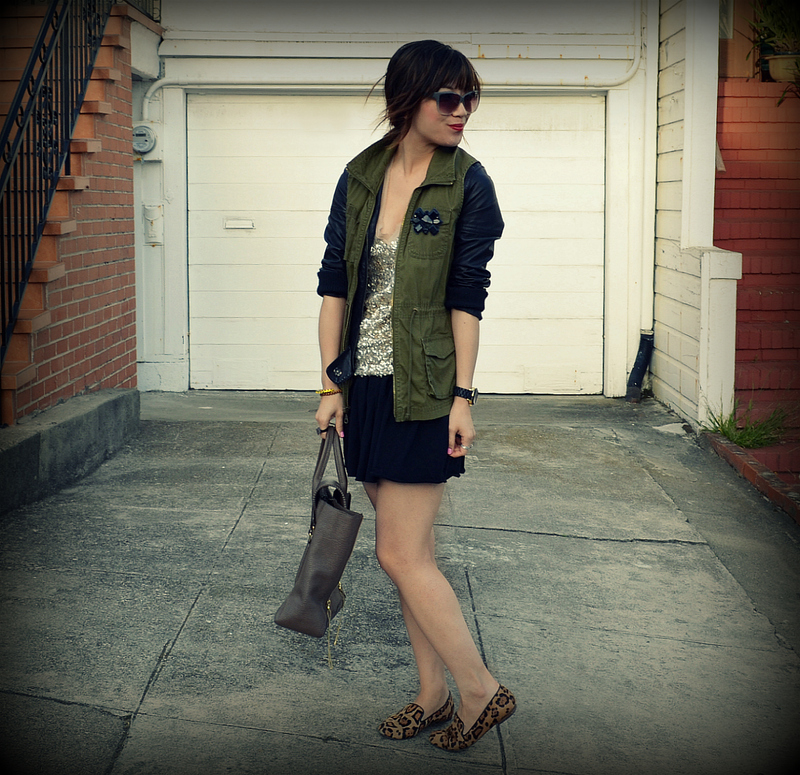 love all the layering and your leopard shoes with your outfit - totally completes the look! Very casual and beautiful. Nicely done. This outfit is perfect. Love the blazer on you. Zara has a jacket like that, I'm dying for it but it's so expensive! And wow, your bag. Wow. Sure I can give you the recipe for the yogurt cake/cupcake. If you'd like me to, I can email it to you! As soon as I saw your first picture, I thought "hmmm. no color..." LOL. It's different from your ususal looks, but this great. This is such a cool jacket. I admire how you have a mix of toughness, glam, and (what I like to call) "rawwrr"! This look is PERFECT!!!! I love everything about it!! Love this outfit! 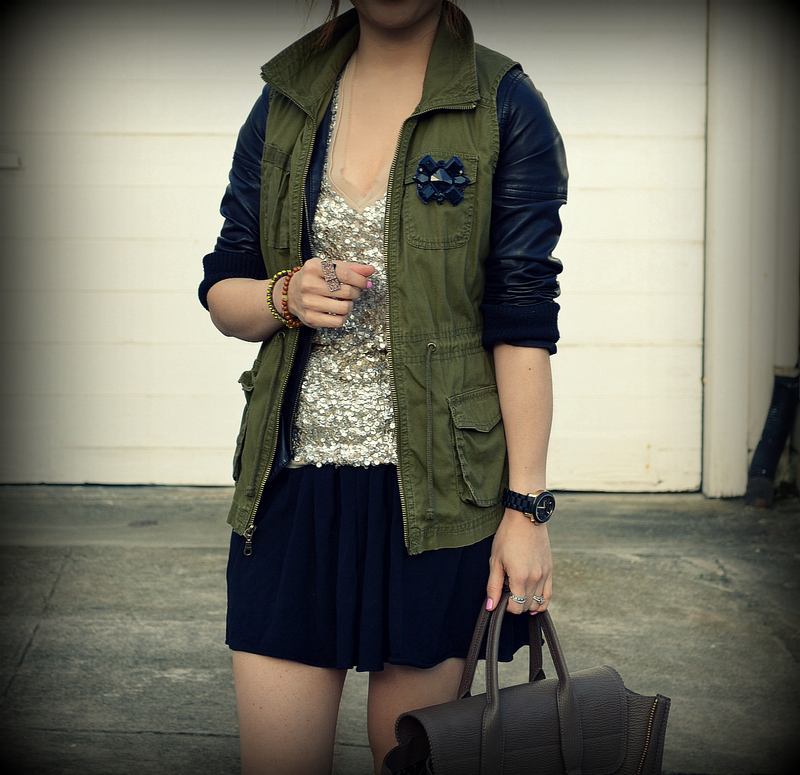 The sequins are so pretty, especially with that vest! Obsessed with loafers...and this pair is fantastic. Really great outfit. Love the mix of textures! Always so cute. Love how the t-shirt stands out. You look really nice. 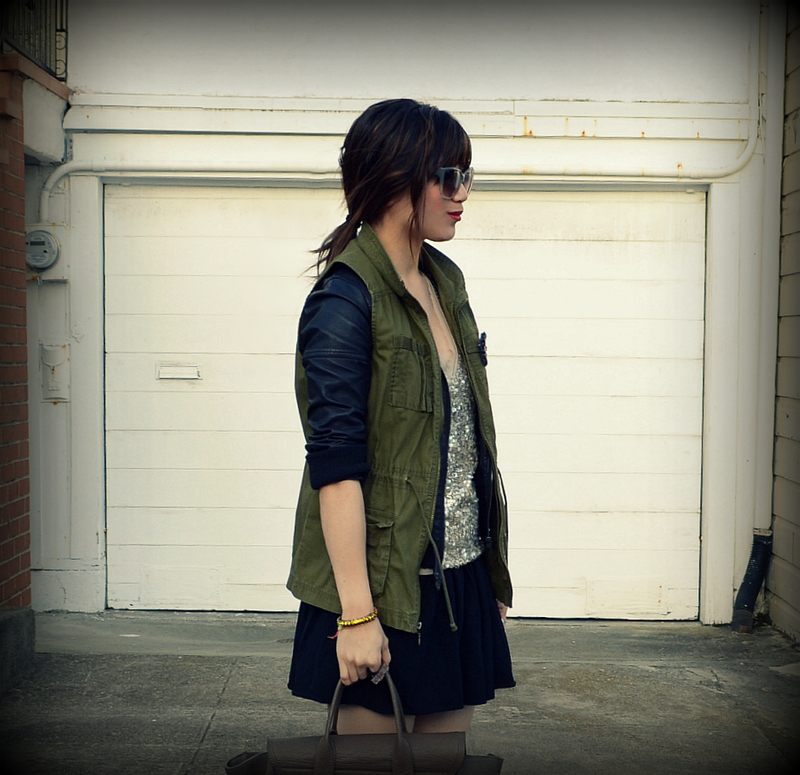 Love the jacket + vest combo! At first I thought it was the Zara jacket, it looks just like it. I need a pair of leopard loafers so bad! Love how they go with just about everything.